After paving has been allowed to settle for a few weeks, you may wish to hose down to remove any excess dirt or sand. You can if necessary treat the area with a week killer suppressant as per the recommended on the label. Your newly installed paving can benefit from paving sealant which combats staining and weed growth whilst enhancing colour and appearance. Acrylic sealers can be sprayed and form sealed skins to the top of the area ensuring an easily maintained finish. Areas must be free from stains or dirt before sealer is applied. Regular sweeping is recommended to maintain appearance. Tyre marks and other staining may be more pronounced on lighter coloured paving. Such instances must be accepted as outside of the manufacturer’s control and additional maintenance bay be required. Medium pressure hosing should remover general dirt and grime. After power washing, sweep jointing sand between the joints of the paving. High pressure power washers are not recommended as damage may be caused to the block surface. Before any cleaning begins, a trail area should be tested. Full ranges of cleaning products are available from general hardware shops. The manufacturer’s recommendations should always be followed when using these products. General cleaning of algae or dirt requires brushing using a generous solution of hot water and washing up liquid, rinsed with lots of clean water. Shaded are beneath trees etc may require repeated treatments. 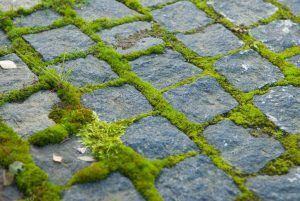 Heavy growth of moss or lichen may need to be removed by first applying paving cleaner. 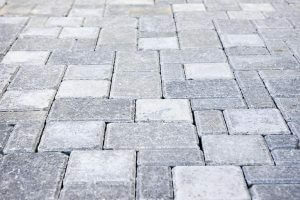 Best applied to a dry paving surface, the solution will take several days to take effect. The dead material can then be easily brushed off. Having your paving area sealed inhibits the growth of weeks, grass, algae and lichen. It also enhances the colour, reduces surface porosity and is easier to maintain in the future. Areas with foot or vehicular traffic is will have restricted weed growth as it prevents weeds from rooting up. Regularly brushing the area will take care of most surface weed invasions. Weeds can be treated using a recommended weed killer solution from garden centres or merchants. 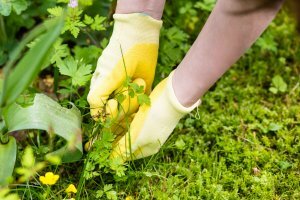 Areas to be treated should have larger weeds removed by hand before applying the solution as per the manufacturer’s instructions. This is the appearance of unsightly white deposits or stains of the surface of the paving blocks. This is neither a manufacturing defect, materials defect nor an installation fault, but a natural occurring phenomenon in the concrete caused by calcium hydroxide (lime deposits) reacting with carbon dioxide in the air. It may seem to disappear when the paving is wet, but the efflorescence salts temporarily vanishes but will return again when the paving dries. Be reassured, efflorescence has no detrimental effect on the paving and will generally disappear with time. Depending on climate conditions and location, it can take 6 months to two years to disappear. Once it does disappear naturally it usually does not reoccur. If it is really bothering you, to improve the appearance short time, you can use a efflorescence remover but be sure to follow the manufacturer’s instructions. Avoid sealing your paving until the problem has cleared up.